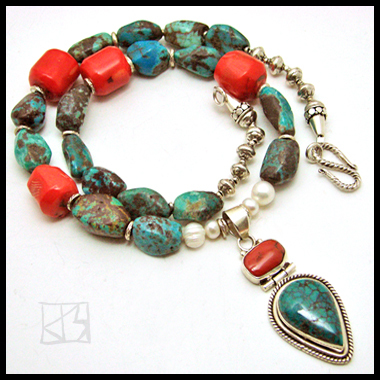 Native turquoise and coral embody the natural history of the Americas in this singular piece! 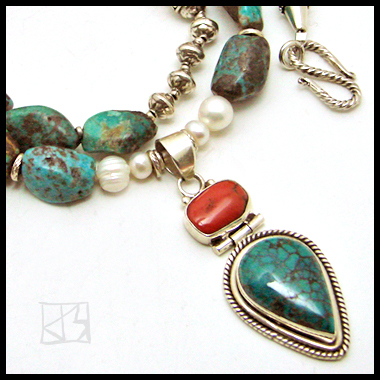 The contrast found in natural turquoise with fascinating veins of dark matrix enhance the beauty of this treasured American stone, and this pendant itself is a quiet statement of contrasts: minimal silver framing the turquoise and coral cabochons. 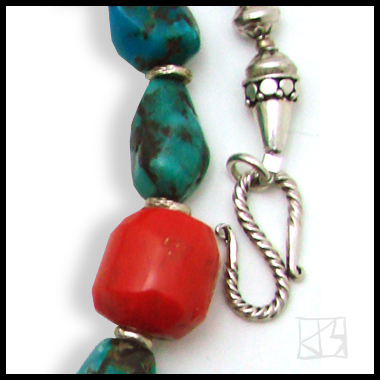 A balance of organic white pearls, matching turquoise and coral nuggets balance the dichotomy of colors in a harmonious embrace, finished with a secure sterling s-hook. Celebrate the past with 21st-century style!